You can enjoy your favourite TV shows and movies with this television's HD LED panel, via one of the 3 HDMI ports. Or connect a Chromecast, Blu-Ray player, sound bar, laptop or games console. Perfect little tv for any bedroom, nice and lightweight flat screen, easy to assemble. Picture quality is fantastic for the price I paid for it. Sound is good too. Freeview tunes it pretty quickly and have the chrome cast plugged in! Overall very impressed with the tv cheers the warehouse. So far the picture quality is pretty ok for a small screen, have connected to chrome cast and is working fine. The sound quality isn’t the flashiest, but I’ll work a way around that with a speaker system at a later point. Now just need to sort the Freeview out, and it’ll be great. Good entry level, basic tv. or glue or stickiness around the edge of the tv I can't get off. It says 1080p when I start tv up on my Xbox but it really actually runs at 720p. Believe me I’ve turned on 1080p on my Xbox but still doesn’t run at that. works like a tv. pro: the usb port is kept on all the time, it is useful for charging your phone and great for powering your Chromecast and allowing you Chromecast to control the TV while the TV is off (e.g. cast something and it switches on your TV.) You can even tell Google assistant to switch off your TV. all these functions work considered you have hdmi-cec turned on in setting. cons: understand it's cheap, but comparing to the older models, the built of this TV is flimsy. almost toyish. poorer sound quality than the older model and light leakage from the sides of the frame. cons: Freeview guide does no justice. the in built interface is horrible. either veon on Freeview gotta do something about this. I have had this t.v for 3years now and still works as if it is new. I have a 2 year old who loves touching the screen on the t.v yet it is still in great condition. No problems at all!! I've had this TV for over 1 1/2 years. The only problem I have is the power button fell off about a year ago, other than that it's a go buy for your buck. 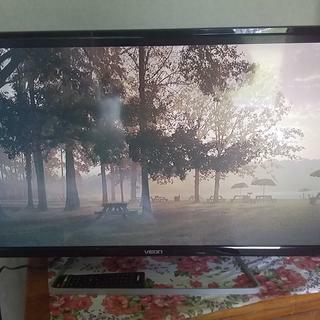 Had this television for one day and screen cracked after light collision with glasses falling off head. Despite a houseful of computer screens, tv screens and cell phone screens, have never had a screen that damaged this easily, from such a minor incident. I recommend going for a more durable option. I am a huge fan of Veon product, I own three Veon televisions, one Veon 2.1 channel soundbar & three mini stereos. Incredible quality & value furor money. Thank you the Warehouse.